The pin is part of a set designed by and made for Mike Finizio of Repast Supply. The counter top base is original with ShopDog Turnery. Bottle stoppers with Presidential dollar inset (obverse side with the Statue of Liberty showing). The wood is from the deck of the battleship USS North Carolina, now docked in Wilmington, NC. 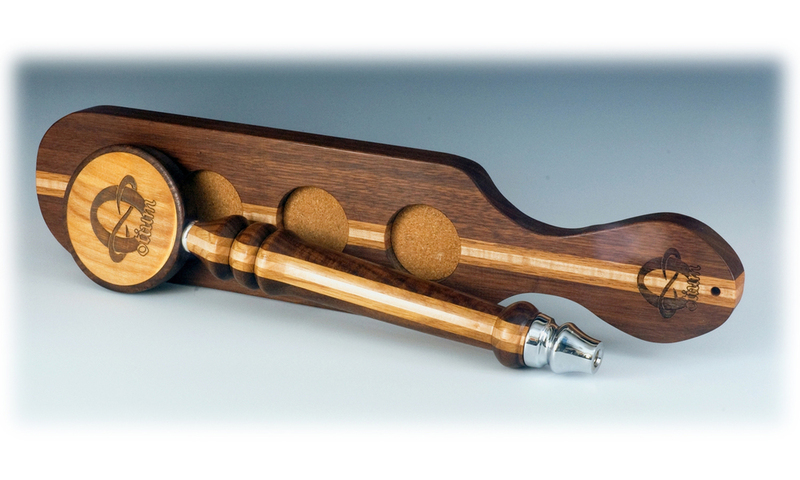 Designed by and made for Mike Finizio of Repast Supply. Set made as a retirement gift for an employee at Balls from this set appear on page 144 of the June 2017 issue of BRIDE'S Magazine. 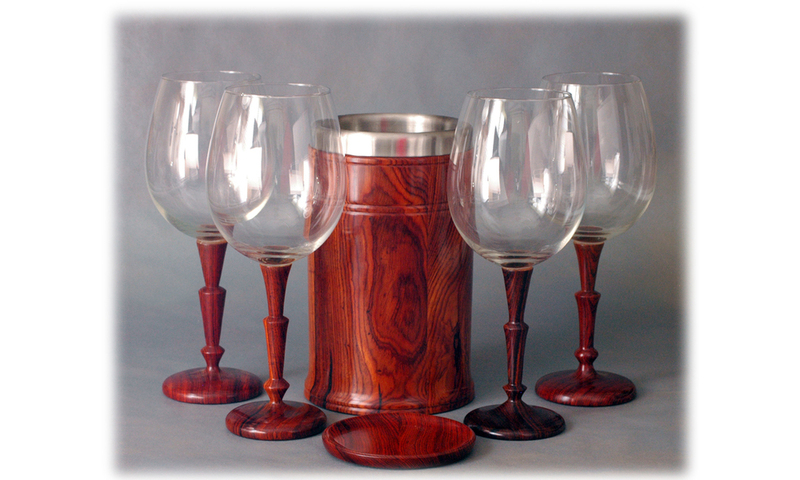 Cocobolo wine set, glasses coaster, cooler. These colorful rattles are more nearly keepsakes than for children's use as the tops are laminated and the handle is dyed. I also make them with either no finish or with only a carnauba wax finish, which is entirely edible, not merely safe. These are gifts from First Round Scoops. I have a large hand, JoAnn not so much. Thus I made one for someone like me, with a large grip, and one for someone like her, with a smaller grip. I make things for the joy of the making. 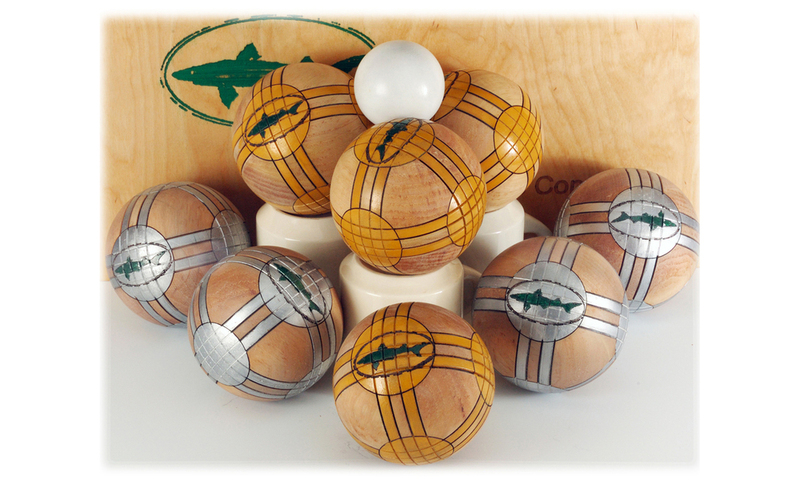 I am careful to use only sustainable woods and food safe finishes for everything I make. 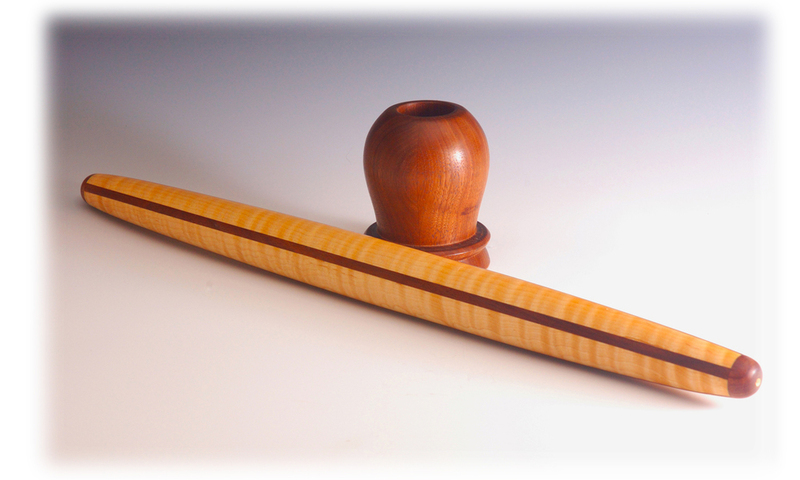 If you find something you like you may purchase it here or, if you find something that triggers your creative juices, so much the better; I can and will make custom turnings using wood important to you or inlaying an important object in a custom turning. I hope you enjoy the site -- drop by both the Pinterest and Instagram sites to find additional information and keep up with what is happening in the turnery.